If you were hit by a bus today or were otherwise incapacitated, would your loved ones be able to quickly locate your important information or know how to handle your affairs? Many of us have a great handle on our finances, but our record keeping systems might not be obvious to family members or friends who might need immediate access to them in times of emergency. Here’s a step-by-step guide to organizing your vital information so it can be conveniently and safely accessed when needed. 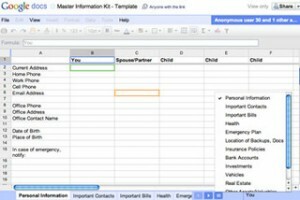 Perhaps the easiest method for creating a centralized document or set of files would be creating a Google Spreadsheet that you could share with your family and friends and keep updated regularly. We’ve created a basic Master Information Kit template just for this purpose. The spreadsheet includes prompts for the information below, but you can customize it for your particular needs. To use the template for yourself, in Google Docs go to File > Make a copy… to save it to your Google account (make sure your version of the document’s sharing settings go back to the default “Private”). 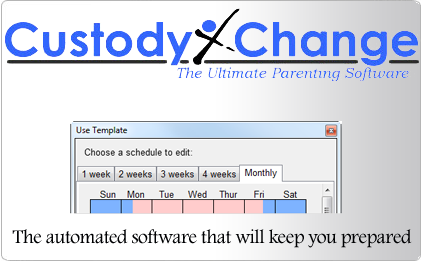 There are really only a few steps to setting this organizer up: gathering your records, securely sharing them, and keeping them updated. Follow along and you’ll have your kit set up in no time—and a little extra peace of mind. Contact information: Both your contact information and your emergency contacts’ info. This includes your nearest relatives, your will executor(s), and employers. Account Passwords: For login information to important accounts, it’s best not to store your logins in an online document like this. Instead you can export your logins from password managers like Keepass, LastPass, or 1Password to a CSV file and then encrypt it so it can be shared securely. Our spreadsheet template includes a sheet specifically for describing your method of storing these files—the location of your vital documents, and any passwords needed to locate them. The Google Docs spreadsheet is easy to share. Once you’ve filled out your version of the spreadsheet, click on the Share button and you can email people who you want to be able to view or edit the document. (Think people who you’d also consider emergency contacts. )For your encrypted files, like the logins mentioned above, you could upload them in Google Docs, store on an encrypted USB thumb drive, or use something like Dropbox. Give the recipients your encryption password but for security reasons, only let them write down a hint to the password. E.g., vacation spot 2010 + pet bday + myfavoritesinger’smiddlename. Also, if you use Dropbox, make sure you encrypt sensitive information first. An encrypted zip file seems an ideal solution. You’ll need to update your files/master records book when you update your accounts. Like setting up an emergency plan or a 72-hour emergency kit, this master information kit will need to be reevaluated regularly—consider doing so at least yearly (e.g., at tax time, when you’re already looking at all your accounts) or, better yet, quarterly. Set up a reminder on your calendar so you won’t forget. When you get your reminder, don’t wait—just quickly look over the items in your document and if anything has changed, update it. If not, you’ve only lost a couple of minutes of your day toward a very good end. If you’re a Quicken user, for example, you may have access to Emergency Records Organizer built into the program, which can compile your emergency documents for you, based on the info you put in Quicken. It should be in the “Property & Debt” menu or you might find the program under your Quicken folder under Program Files. Erik Dewey’s free Big Book of Everything is a very thorough organizer for all your affairs, with placeholders for you to record your bank accounts, insurance policies, tax records, and more. The 44-page Big Book of Everything is available in PDF or Excel format. There are also a few personal documents organizers in dead-tree version, like For the Recordwith the same purpose, in case you want pre-printed book. Do you have all your important information organized somewhere or tips for creating this “everything document”? Let us know in the comments.